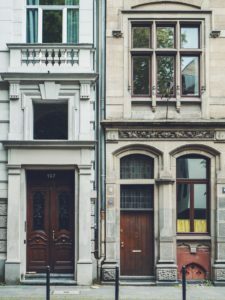 5 Outstanding Types of Doors You Should Be Considering for Your Home - Forde Windows & Remodeling, Inc. These 5 types of doors are favorites among homeowners looking to replace their internal and external entryways. Check them out and get inspired! Has your home become dull and boring? You might consider giving your home a makeover. Even a partial remodel can give your home new life. You might try ditching the old carpet, repainting an accent wall, or moving the furniture around, but it’s still missing something. Doors and windows are the most underappreciated accents in your home. Your front door, for example, is the first thing people see when they approach your home. Are your guests going to see a dilapidated, old door when they first arrive? Fact: people who have cool doors in their homes are 100% more awesome than those without cool doors. But which cool door is best for your home? When you’re ready to upgrade your home, check out our recommendations for the best types of doors to have in your home. If you’re looking to go the traditional route, timber is your best bet. Wooden doors are among the most popular choice because they are so universal. Looking for a historic feel? Going for a modern approach? Either way, timber is a great choice. You can style your door as much as you’d like, from a plain flush design to an all out, intricate wooden carving. Another benefit of timber doors is availability. Wood is more readily available and many local carpenters will be able to create a masterpiece with ease. Adding a glass door can be a great accent to your home. Many people opt for glass doors toward the backside of their homes. If you choose a completely clear glass, consider using it for the back door. This will give you an unobstructed view of your patio or garden. Are you more of a fan of cloudy glass? If you’re brave, adding a cloudy-style glass door to your bathroom entryway is a great way to give the entire room an upgraded feel. Fiberglass is rapidly growing in the market. If you’re going for a green home, fiberglass just might be your golden ticket. The non-conductivity of heat and cold that fiberglass has makes it ideal for any exterior door. Fiberglass is also lightweight, dent resistant, and low-maintenance. The only disadvantage with fiberglass is the relatively high price. Similar to wooden doors, metal doors are very universal. You can choose a style that gives your home more of an antique look or go for the more modern chrome look. If you’re going to go the metal route, you’ll need to know which type of metal you prefer. Steel and aluminum are the most popular metals for doors. Steel doors are almost exclusive to outside doors. Many steel doors are not actually made of plain steel, rather two “skins” of steel with a foam core. The foam acts as insulation to keep your home cool in the summer and warm in the winter. From a price perspective, steel is a much better choice than wood or fiberglass. Steel tends to be less expensive and also offers an excellent return investment when you decide to sell your home. Aluminum doors are suitable for inside or outside your home. The lightweight material gives it an advantage over steel. Aluminum can be used as a sliding door or side door. Since the aluminum door is so lightweight, it transfers less of a weight load onto the foundation of your home. Aluminum doors are both aesthetically pleasing and economical. Unlike traditional timber, bamboo is one of the fastest replenishing resource plants. The maturity of a bamboo plant is about 3-4 years, while traditional timber, oak, for example, can take 75 years or longer. Bamboo doors are superior to traditional timber also in the fact that they are termite and corrosion resistant. Once you choose the material of your door, you’ll need to choose a style. We’ve included a few different style choices to help you kickstart your decision making. Flush doors are solid, flat, and plain doors. They are typical for interior doors such as bedrooms or closets. Flush doors will be the most cost-effective, especially if they are hollow on the inside. French doors are a great way to add an elegant and traditional style to any home. Commonly found in Paris, these doors are often used as an entrance to a formal public area, such as a dining room. French doors are also beautiful leading out to a balcony, patio, or deck. Barn doors are trending right now, and are often used for dramatic effect. You might add a set of barn doors to a large walk-in closet or out to the garage. Barn doors typically slide open and closed and are generally made with reclaimed wood. For a fun, modern look, try the barn door style with a steel or aluminum frame instead of wood. This could give your home that “it” factor that you’ve been looking for. Which Types of Doors Will You Choose? No matter the size or style, the type of door you choose is ultimately yours. Ready to get started? Find out when is the best time of the year to start your home remodel. Here at Forde Windows and Remodeling, we strive to always bring your visions to life. With over 30 years of experience, we’re ready to help you rebuild, refurbish, or remodel your dream home – your way. Contact us today for a free estimate on your home.